A bouquet of flowers, especially roses, seemingly trivial gift for a girl. However, a closer look at it, because he can tell a lot about the thoughts and desires of the man who gave you such a gift. Sometimes the feelings are so hard to say out loud. Even the strongest and bravest men in love can tremble, blush and stutter, being face to face with the object of their feelings. A couple of centuries ago to talk about love was considered altogether improper. The language of flowers was born in the East, where women had no rights and to satisfy their need to communicate, invented a way to symbolically tell about his attitude and mood. After knowledge of the flower language was retold in the books, he quickly became popular in Europe, especially in England and France. Later brochures on the values of various colors appeared in Russia. Values of plants were formed on the basis of myths and legends. This knowledge also mingled interpretations of the shades that exist in one or the other nation. Based on the composition of the bouquet, the number of plants, herbs and way of presenting, and discern secret message. The language of flowers has not been forgotten in the twenty-first century. Fans derive new values, combining the ancient esoteric interpretation of the values of plants. White is associated with innocence and purity. 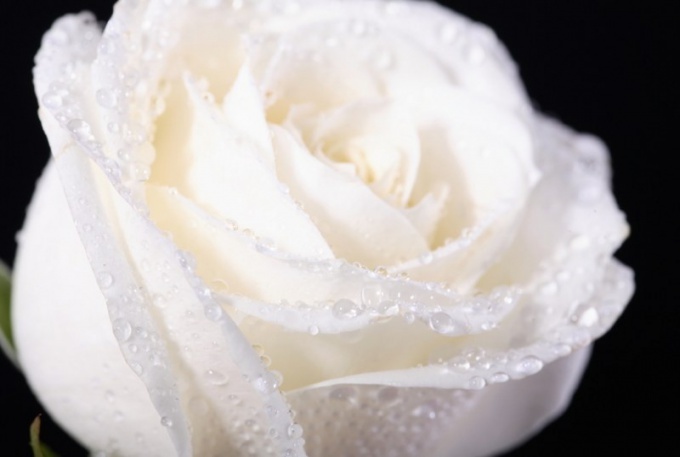 This value is preserved for the white roses. The young man, handing this gift to his ladylove, thus underlines its outstanding quality. In this simple way he expresses his admiration and willingness to take care of her, because girlfriend is being perceived as a fragile unearthly creature. Man, giving white roses, most likely conservative. He was not interested in a short-term affair. It is set on a long-term relationship embodied by all the rules. Bouquet of white roses alludes to the sincere and tender feelings, but does not imply a passion and physical intimacy because at this point, it may be even inappropriate. According to legend, the Archangel Gabriel to comfort the mother of God wove her wreath of white roses. Once these flowers meant joy, but since then the value has changed. A bouquet of white roses can be quite innocent gift for a friend, relative or colleague, not a signifier of love. Invariably, only one – a girl who receives such a gift, think clean, pretty and defenseless, and makes men grudging admiration and desire to protect her, which does not mean a desire to translate a friendly relationship into love.